Top L: Shutterstock; bottom L: NBC Washington; 2nd from L: Shutterstock; 2nd from top R: NBC Washington; 2nd from bottom R: Shutterstock; top R: Shutterstock; bottom R: NBC Washington. You have three months to get outside, see the sights, host some barbecues and much more -- here are 100 ways to make the most of your summer. While you're out and about on your summer adventures, tweet or tag us in your photos using the hashtag #NBC4DC. We just may feature you on air or on NBC Washington's Instagram feed! 1. Make a splash in pools, water parks and lazy rivers! 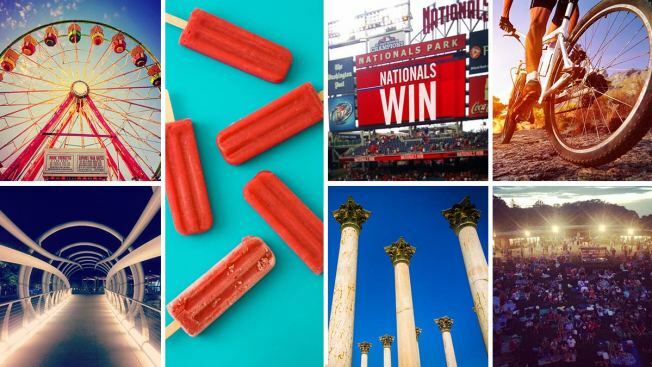 See the D.C. area's top 10 places to beat the heat. 2. Pick strawberries or enjoy a strawberry dish. Head out in early June to a nearby patch such as Butler's Orchard in Germantown, Maryland. Check out strawberry recipes here. 3. Fire up the grill -- see tips and hamburger recipes to make your backyard BBQ sizzle. 4. Attend the AFI DOCS film festival, June 22-26. There are 90 films representing 30 countries on the slate of documentaries screening at the AFI Silver Theatre (8633 Colesville Road, Silver Spring). 5. Crack open some crabs. Check out the Chesapeake Crab Festival on June 25 at Baltimore's Inner Harbor and then on Aug. 27 at Prince George's County's National Harbor. 6. Dive into Shark Week. Tune into Discovery Channel for a marathon of all things shark starting June 26. 7. Get welcomed to the jungle. Zipline and climb through Sandy Springs Adventure Park in Montgomery County, billed as the largest man-made outdoor climbing adventure in the world. 8. Head for the beach. Check out the top beaches within an easy drive of the D.C. area. 9. Sip fruit-infused water. It's like summer in a glass. 10. Catch a summer movie blockbuster. Buzzworthy movies heading to the box office this summer include "Central Intelligence" (June 17), "Independence Day: Resurgence" (June 24), "Free State of Jones" (June 24), "Ghostbusters" (July 15), and "Bad Moms" (July 29). 11. See an arena concert. Paul McCartney, Maroon 5, Fifth Harmony and Luke Bryan are among the stars coming to town this summer. Find more shows here. 12. Hit the golf course. Tiger Woods hosts the Quicken Loans National tournament in its return to Bethesda's Congressional Country Club, June 23-26. 13. Take a road trip to the Bayou Boogaloo & Cajun Food Festival, happening June 24-26, in Norfolk. 14. Hit up the Capital Fringe Music Festival, June 25-26. The outdoor music festival -- an offshoot of the Capital Fringe Festival, coming up later in the summer -- showcases live music performances, theater, dance and puppetry. 15. Upgrade your snow cone. Shave ice is a popular Hawaiian dessert with a fine, snowy texture paired with a fruity, sweet taste. 16. Celebrate National Sunglasses Day. Sport your favorite summer shades June 27. 17. Forage from some of D.C.'s most beloved food trucks at the Fairgrounds (1201 Half St. SE). You still have three chances to catch the monthly food truck fest, Truckeroo, on July 8, Aug. 19 and Sept. 16. 19. Enjoy summer fruits. Check out delicious ways to snack up on nature's bounty! 20. Take home a furry new friend. Hundreds of animal shelters will come together July 23 for Clear the Shelters, a nationwide animal adoption drive. 21. Have a lazy summer day. Stretch out, lounge -- and get your TV binge on! New seasons of "Orange is the New Black," "Grey's Anatomy" and "Marvel Agents of S.H.I.E.L.D" will all be on Netflix in June. 22. Take yourself out to the ballgame. Get tickets to a game at Nats Park. 23. Mix a summer drink. Start your mixology training with a refreshing, fruity cocktail. 24. Celebrate the '80s. "Ferris Bueller's Day Off" and "Pretty in Pink" turn 30, and are among the many free outdoor movies playing in the DMV this summer. And, yes, that's totally awesome! 25. Catch plays, dance, music and "unclassifiable" live performances during the annual Capital Fringe Festival. This year's festival, happening July 7-31, includes shows all over the D.C. area. 26. Giddy up. Shenandoah National Park in Virginia offers guided horseback rides through the scenic Blue Ridge trails. 27. Visit the Smithsonian Folklife Festival. "Ferris Bueller's Day Off" and "Pretty in Pink" turn 30, and are among the many free outdoor movies playing in the DMV this summer. And, yes, that's totally awesome! The National Mall turns into the Basque Country, starting June 29-July 4 and continuing July 7-10. 28. Enjoy Rickey Month in July. Dubbed the official cocktail of D.C., the Rickey has been called "air conditioning in a glass." 29. Celebrate the Air and Space Museum's 40th birthday by spending All Night at the Museum. The iconic building on the mall will be open all night -- from 8:30 p.m. July 1 to 10 a.m. July 2 -- for one big, free party, although the 21+ event requires tickets. 30. Stretch in the park. Here are some of the top outdoor yoga programs in the District with free classes through the summer. 31. See "ICEBERGS" at the National Building Museum. From July 2 to Sept. 5, the museum will be transformed by massive icebergs built out of transparent polycarbonate panels. Visitors can climb an iceberg and see the "ocean floor" below. 32. Celebrate America. Grab some apple pie, check out a July 4 parade and get ready for the main event -- spectacular fireworks! Find an event near you. 33. Visit The Renwick Gallery. You have until July 10 to check out the larger-than-life installations of the WONDER exhibit on the museum's first floor. 34. Take a day trip. Who said a staycation has to be boring? Head out to one of these exciting destinations in Maryland or Virginia. 35. Kayak or paddle along the Potomac. You can rent stand-up paddleboards and kayaks at the Key Bridge Boathouse (3500 Water St. NW, beneath the Key Bridge) and Thompson Boat Center (2900 Virginia Ave. NW, near the Watergate). 36. Explore Theodore Roosevelt Island. The area is one of D.C.'s hidden gems, and honors our 26th president's love of the outdoors. Explore the trails through wooded swamplands or kayak around the island. 37. Make a summer playlist. What tops your list of favorite summer jams? 38. Stroll along the National Mall. Become a tourist for the day and see the monuments millions travel to see each year. 39. Have a staring contest with a celebrity. The National Portrait Gallery's "Eye Pop: The Celebrity Gaze" runs through July 10 and features Oprah Winfrey, Katy Perry, Kobe Bryant, Serena Williams and more superstars giving their best "Blue Steel" pose. 40. Set sail in Annapolis. Maryland's capital is a nautical heavyweight. Take in the gorgeous views, restaurants, bars, boats -- and all the crab cakes you can eat. 41. Drink by the water. Cheers to the best waterfront bars from Georgetown to Annapolis. 42. Slide the City.The world's longest water slide will take over Tysons Corner for one day only, July 16. 43. Scream for ice cream. Celebrate National Ice Cream Day July 17 at one of the best ice cream spots in the DMV. 44. Say hello to Bei Bei. Check up on D.C.'s cute panda cub at the National Zoo. 45. Take a hike. White Oak Canyon, Great Falls and Rock Creek Park offer scenic trails to take advantage of. 46. Go wild at an amusement park. Kings Dominion, Busch Gardens and Six Flags America are packed with monster coasters and huge water parks. 47. Go tubing. Float the day away on an inner tube, or turn up the adventure with a rafting, canoeing or kayaking expedition. 48. Dance in Glen Echo Park. Prepare to sweat in style. 49. Cool down with a popsicle. If you need some icy inspiration, we've rounded up a collection of popsicles perfect for the young and young at heart. 50. Escape to Tilghman Island. This quaint Maryland island hosts a seafood festival July 16. 51. Visit Brew at the Zoo. The Smithsonian National Zoo's annual beer fest will feature 70 craft breweries, live entertainment, plus the chance to meet and greet some animals July 21. 52. See the horses of Chincoteague. The wild ponies make their annual pony swim from Assateague Island to Chincoteague on July 27. 53. Grab a wing. National Chicken Wing Day is July 29. Need we say more? 54. Watch "Sharknado 4: The 4th Awakens." Syfy's fourth installment (yes, FOURTH) of this thrilling-meets-ridiculous franchise premieres July 31. 55. Drink on the roof. You can enjoy the sunset while sipping a cocktail on one of these top D.C. rooftop bars. 56. Camp next to a waterpark. Commune with nature and make a splash at Pohick Bay Regional Park in Lorton, Virginia. 57. Try making lobster rolls at home.Here are tons of recipes to inspire you to host a backyard lobster boil. 58. Take advantage of tax-free shopping. Bookmark these dates: Aug. 5-7 (Virginia); Aug. 14-20 (Maryland). 59. Get Olympic fever! Tune in to see the world's best athletes take over Rio de Janeiro for the 2016 Summer Olympics on NBC4, Aug. 5-21. 60. Go to a county fair ... and eat everything fried. 61. Get ready for football. The Redskins; preseason schedule starts Aug. 11. 62. Tour Luray Caverns. Discovered in 1878, gorgeous rock formations in Virginia's Shenandoah Valley is a popular tourist attraction. Bonus: The cooler underground temperatures will help you chill on hot summer day. 63. Make a wish. The Perseid meteor shower peaks on Aug. 12-13. 64. Find time for wine! Check out our picks for the Top 5 Virginia Wineries. Or indulge at a fest such as the Purcellville Wine & Food Festival on July 16. 65. Ride the Capital Wheel at National Harbor. Take in breathtaking views from 180 feet above the Potomac River. 66. Try D.C.'s finest cuisine during Restaurant Week. Stretch your dollar, Aug. 15-21. 67. Hit a seafood dive. Baltimore, Annapolis and Ocean City are top contenders for fantastic seafood dives in the mid-Atlantic area. 68. Smell the flowers at the National Arboretum (3501 New York Ave. NE). Walk through the stunning gardens and woods for free until 5 p.m. each day. 69. Feel the need for speed. Catch a drag race or NASCAR race at Dominion Raceway. 70. Make a summer pie.Strawberry season is upon us -- along with plenty of other summer fruits -- so it may be tme to try a new recipe. 71. Dip your toes in the Yards Park fountain. Then dine on the waterfront or catch a free Friday summer concert. 72. Ride a bike. Explore one of D.C.'s many bike trails. 73. Tour Frederick Douglass National Historic Site. Catch a tour of the legendary abolitionist's home. 74. Scour Eastern Market (225 7th St. SE) for fresh fruits and veggies, meats, treats and treasures. Local artists and vendors set up outside, as does a fantastic flea market (7th Street SE between C Street and Pennsylvania Avenue SE). Top it all off with a stop at the absolutely perfect local gem Capitol Hill Books. 75. Check out the tall ships. Massive ships from around the world sail into Baltimore's Inner Harbor this summer. Visit Sail Baltimore's website for the full schedule. 76. Jump out of a plane at Skydive Orange. But if freefalling two miles above the ground isn't your thing, check out the indoor skydiving facility iFly in Ashburn, Virginia. 77. Daytrip to Baltimore. Hang out at the Inner Harbor, see an Orioles game at Camden Yards and check out where Francis Scott Key made history when he wrote "The Star Spangled Banner." 79. Make a shrimp dish. We've rounded up everything you want to know about making just about any kind of shrimp. 80. Take a lunch/dinner cruise. See the D.C. monuments from the Potomac River on the Odyssey or Spirit of Washington. 81. Have a half smoke at Ben's Chili Bowl. 82. Take a DC Duck Sightseeing Tour. The 90-minute tour takes you around the city by sea and land in a double-duty vehicle built during World War II. 83. Tour the International Spy Museum. Channel your inner James Bond and put your spy skills to the test. 84. Paddle around the Tidal Basin. Get a workout and a beautiful view of the Washington Monument and Jefferson Memorial. 85. Play in the sand at National Harbor. The Awakening sculpture is an interactive art installation of a bearded giant emerging from the sand. 86. Spend a day at Mount Vernon. See where George Washington called home, plus take in panoramic views of the Potomac River. 87. Walk the C&O Canal Towpath. Take in nature and history along this Georgetown treasure. 88. See the stars in Rock Creek Park. The Rock Creek Park Nature Center and Planetarium (5200 Glover Road NW) takes you around the universe -- for free. 89. Take a break from 2016. Step back in time and explore Colonial Williamsburg. 90. Take a stroll through the Historic Congressional Cemetery(1801 E St. SE). More than 67,000 impactful Washingtonians have been buried in the 35-acre cemetery. 91. Swim in style. Hit up one of the pool parties at the Capitol Skyline Hotel (10 I St. SW). 92. Enjoy fresh air at Catoctin Mountain Park. Fish, horseback ride, rock climb, camp -- you can show off your inner outdoorsman here. 93. Get a snack from a food boat. Nauti Foods serves up treats on the Potomac. 94. Walk around the National Mall monuments at sunset. Stick around a little longer to take some beautiful nighttime photos. 95. Take a brew tour. D.C. Brew Tours' The Original D.C. Craft Brew Tour is a great way to sample the area's beer scene. Plus, your ticket also includes VIP tours of at least three of the four breweries you will visit on the. 96. Bask in some great views of the city at the top of the Washington Monument. It's definitely a tourist-y activity, but summer is the perfect time to head to the top of the tower for the beautiful photo-op. 97. Visit a farmer's market.FRESHFARM Markets hosts tons of open-air farmers markets all around the city throughout the summer. 98. Bid farewell to summer. Enjoy the sounds and the last of the summer days Sept. 5 at the Bethany Beach Jazz Funeral on the Bethany Beach Boardwalk. 99. Relax on the Capitol lawn and take in music from the National Symphony Orchestra at D.C.'s free Labor Day Capitol Concert at the U.S. Capitol. 100. Celebrate H Street with food, music, vendors and plenty of neighborhood fun. This year's H Street Festival will take place Sept. 17, just before the official start of fall.